Preheat the oven to 180 °C (350 °F). Using a sharp knife, trim the excess fat around the breasts, then score the skin in a checkerboard pattern, without cutting into the flesh. Add salt and pepper to taste. Heat a large ovenproof skillet over medium heat. Add the duck breasts to the skillet, skin side down, and sear without touching for 8 to 10 minutes. Remove the melted fat from the skillet as needed during cooking. 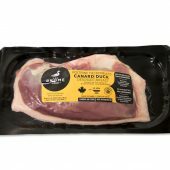 Turn the duck breasts over in the pan and then continue cooking in the oven for 8 to 10 minutes or until it reaches an internal temperature of 58 °C (137 °F). The duck breasts should be moderately firm to the touch and still pink inside. 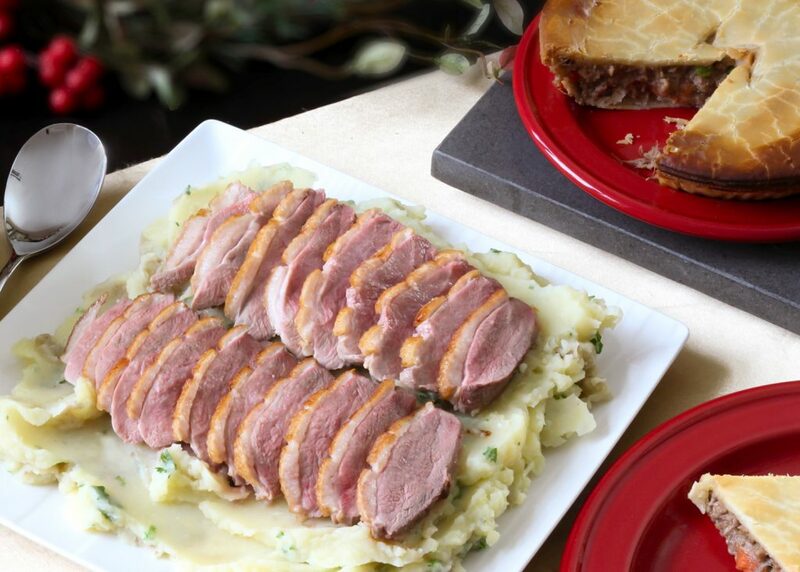 Remove the duck breasts from the oven and place on a cutting board. Let stand for 5 minutes, loosely covered with a sheet of aluminium foil. Cut on the diagonal and arrange pieces on a large, narrow and long serving platter topped with a generous layer of garlic mashed potatoes. Serve immediately with steamed broccoli and a country style duck pot pie from Brome Lake. Preheat the oven to 200°C (400°F). Slice the top off the garlic bulb just enough to expose the top of the cloves, and bake for 30 minutes in the oven. In the meantime, boil the potatoes in a large saucepan of salted water until tender. Drain potatoes in the pot, leaving a little cooking water in the bottom. Add butter to taste, then vigorously mash. Stir in duck stock or liquid of choice, and mash again until desired consistency is obtained. Season to taste with salt, pepper, granulated garlic, and mix. Remove the bulb of garlic from the oven and extract the flesh by squeezing the bulb over a mortar to get as much garlic out as possible. Grind into a puree and add to the mashed potatoes. Add the parsley and mix well. Cover and set aside until serving time.